TANKED returns with all new episodes as the latest series sees high profile clients including American rapper, Tyga, gold-legend, Bubba Watson and three-time NBA All-Star, Paul George! 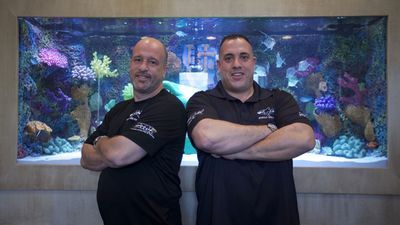 The duo behind the aquatic transformations are best friends and brother-in-laws, Wayde King and Brett Raymer, who are challenged with making jaw dropping, one-of-a-kind tanks for some of the most striking fish and clients around the world – no job is too big or too outlandish for the ambitious duo. Acrylic Tank Manufacturing has already created thousands of enormous, striking aquarium builds and this series is no different. Working alongside their opinionated and outrageous family and staff, including Wayde's wife, Heather, and Brett and Heather's father, "The General", the new series follows the stresses and successes of a business that has been running strong for 14 years.